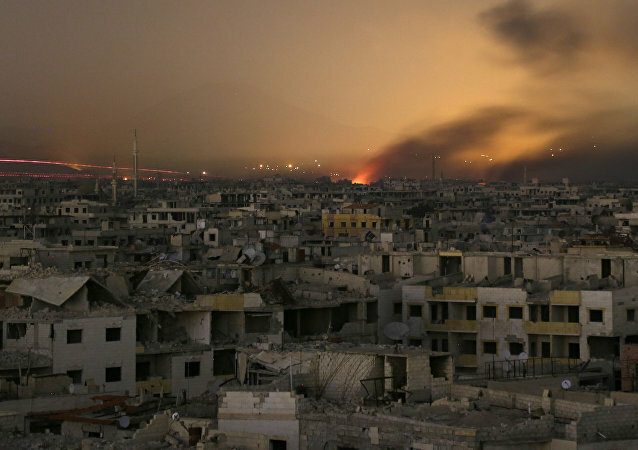 The gruesome find is just the latest in a series made by Syrian forces as they come closer and closer to liquidating the hardline Islamist-held pocket east of Damascus. Damascus is seemingly not interested in the withdrawal of Iranian forces from Syria, given the US military presence in the region, political analyst Hassan Hanizadeh, former editor-in-chief of the Iranian news agency Mehr News, has told Sputnik, adding that Tehran would pull out immediately at the request of the Syrian government. The Syrian Arab Army (SAA) needs to understand that the al-Nusra Front terrorists and their allies will continue to adjust their tactics in the Idlib province and actively operate in different directions, targeting moderate opposition, Russian military analyst Andrei Koshkin told Radio Sputnik. A Kurdish source told Sputnik that Syrian militants conduct an offensive to the north of Afrin in the Aleppo province with the support of the Turkish army. 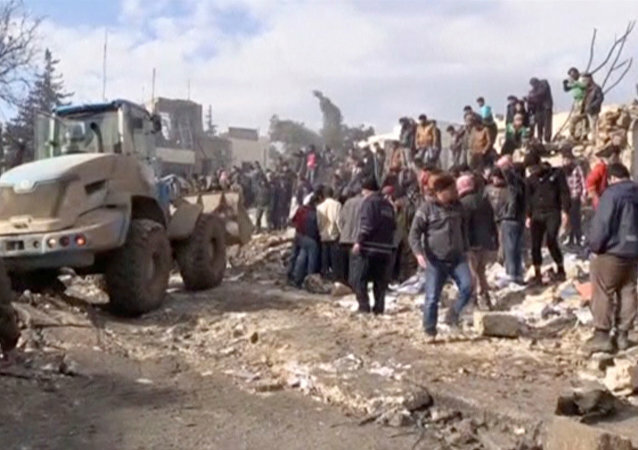 At least 45 people were killed and 30 wounded by suicide bombing in Syria's Idlib province. Turkey will announce in the coming days whether it will hand over a captured Syrian pilot who landed on the Turkish side of the border after ejecting from a crashing military plane to Syria, Turkish Deputy Prime Minister Nurettin Canikli said Sunday. The Syrian opposition High Negotiations Committee (HNC) on Sunday announced the final composition of the delegation to go to the February 20 settlement talks in Geneva. As many as 27 groups of the armed Syrian opposition and the so-called interim government of Syria signed a final document at the opposition meeting in Ankara, according to the document seen by Sputnik. The number of those injured as a result of the explosion in the northern Syrian city of Azaz has exceeded 100, sources told Sputnik Saturday. 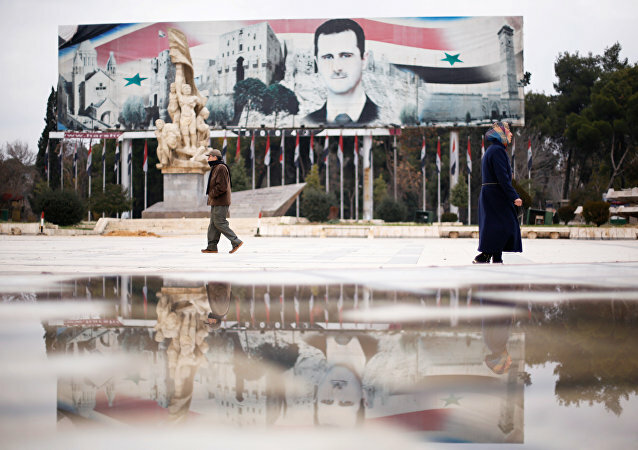 A nationwide Syrian ceasefire brokered by Moscow, Ankara and Tehran has come into effect, with several key radical groups pledging to cut ties with al-Nusra Front and Daesh. This is something Washington promised to achieve, but failed to deliver, political analyst Elena Suponina wrote for RIA Novosti. The Russian Defense Ministry unveiled a list of armed opposition groups that includes Ahrar al-Sham, Jaish al-Islam, Jaish al-Mujahideen, Faylak al-Sham, Suvar al-Sham, Jaish Idlib, and Jabhat al-Shamiya that had agreed to join a nationwide ceasefire in Syria. The decision of Washington, London and Paris to block Moscow's request to recognize Ahrar al-Sham and Jaysh al-Islam as terror groups calls into question the sincerity of the sides in their commitment to fighting extremism, Russia's ambassador to Britain said. Three German nationals have been detained by local police over their alleged ties to the Ahrar ash-Sham jihadist group operating in Syria, the Federal Prosecutor's Office in Karlsruhe said on Tuesday cited by local media. 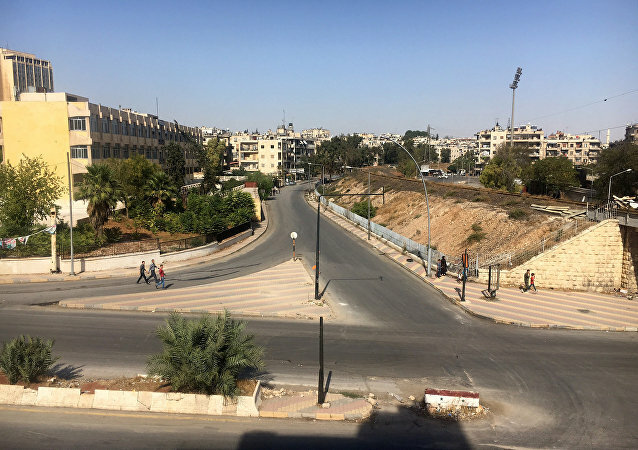 Khaled Kadura, a small business owner, and his family were forced to flee eastern Aleppo, leaving everything they had behind, because Ahrar al-Sham rebels turned their life into a "tragedy," terrorizing those who could not fight back and spreading lies about Damascus, he told Sputnik. 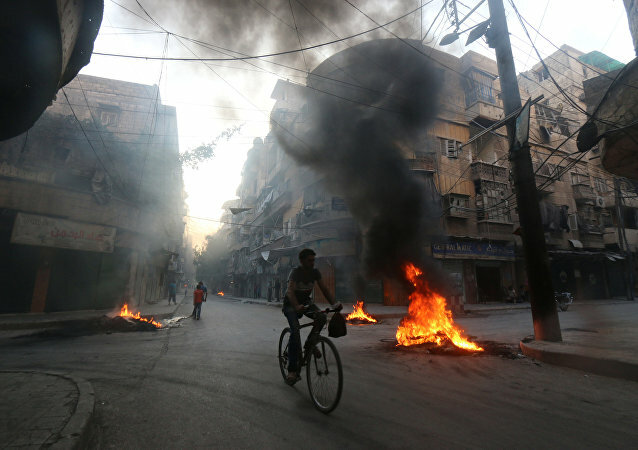 The first day of the “humanitarian pause” in Syrian Aleppo did not lead to any desired results. Following the halt in the airstrikes, the terrorists in turn responded with mortar fire. Did Hillary Call for ‘Killing a Lot of Civilians’ in Syria During the Debate? In a leaked transcript of her paid speeches to Wall Street executives and the wealthy, Hillary Clinton acknowledged that a no-fly zone in Syria would have horrific human consequences, but the candidate spoke in favor of the position to 100 million American voters. 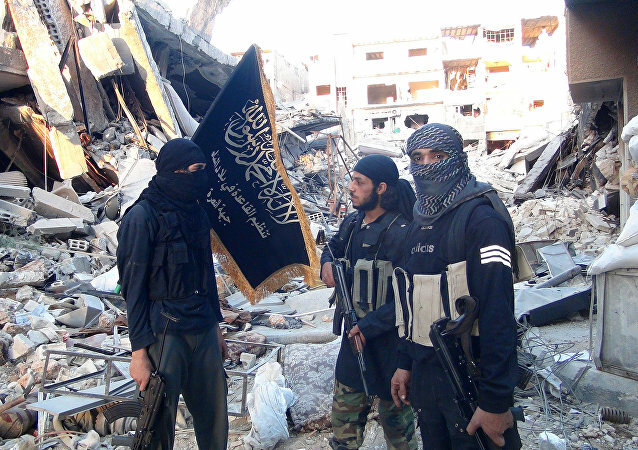 Daesh (ISIS) offshoot Jund al-Aqsa paid allegiance to Syria’s al-Qaeda affiliate Al-Nusra Front in an effort to halt attacks from US-backed rebel groups aligned with the terrorist organization. 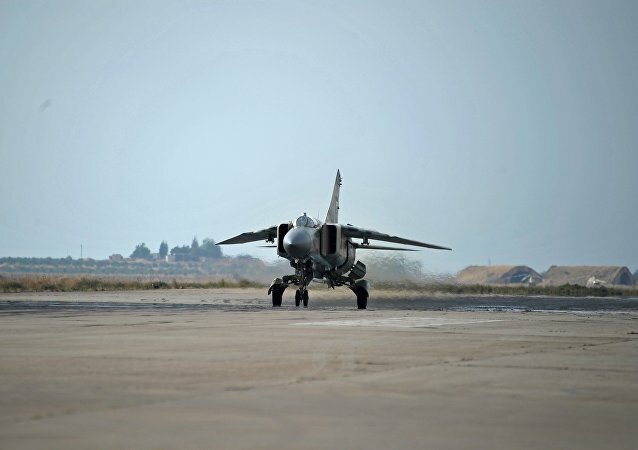 The Syrian Air Force struck critical strongholds of Al-Nusra Front terrorists on Sunday in a stunning bombing barrage pushing the al-Qaeda affiliate on its heels.